Thinking of adopting a multi-device learning strategy? Here at Engage in Learning, we want to make your life as easy as possible. So if you are considering multi-device eLearning, this guide will help you understand this approach and know which content areas would be best suited to this area of learning. Know how to deliver a multi-device learning strategy- Does your LMS support mobile delivery? Does it offer an app? How will you track completion and performance? Understand how to get started with multi-device learning - Will it engage staff? Will it work? Will it save time or cost time? Understand what a multi-device learning strategy is- Is this similar to mobile learning? What can multi-device learning offer a business? Will this make learning on the go possible? We know that companies seek eLearning solutions that are specific to their different needs, training budget and learning culture, which is why we work in partnership with our customers to ensure the right solution is provided. We also offer practical help and guidance on how to effectively engage staff in the learning journey. 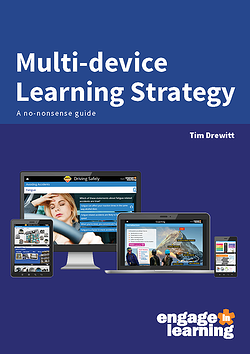 Once you’ve downloaded and read this free eBook you will be in the best position to begin delivering an effective multi-device learning strategy for your organisation.